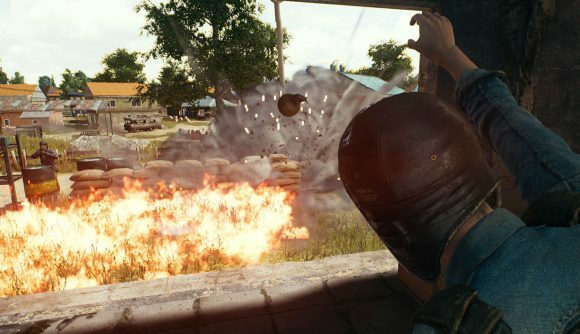 PUBG’s latest event mode could be its most chaotic yet. You might have thought that the deathmatch mode – or the one that let you spawn enormous armoured Jeeps – would take that title, but you’d be wrong. This week’s event, Dodgebomb, promises to bring a new level of destruction to the game. That’s because you won’t be going in with a gun, as you’d normally expect from a game of PUBG. Instead, you’ll be hot-dropping as part of one of three ten-person teams, all 30 of you armed to the teeth with an arsenal of 20 grenades. If all that’s not enough destruction for you, then you’ll also have a Molotov Cocktail added to your arsenal for good measure. On top of that, you’ll be kitted out with level three gear, and, just to complete the look, a trusty frying pan. The mode will play out similarly to previous deathmatch modes, with three points awarded for each kill (up to a 100 point victory condition), and eliminated players able to respawn every 30 seconds. To keep with the explosively fast pace of the new mode, there’ll be no knockdowns or revives – once you take lethal damage, you’re out of the action until the next flyover, so you can’t rely on your teammates to get you out of a tight spot. Thankfully though, there’s no friendly fire, so you don’t have to worry about getting blown up by your buddy’s stray grenade. Dodgebomb starts tomorrow, August 10 at 03:00 BST (22:00 on August 9 for ET), and will run until Sunday night/Monday morning. NA and EU servers will have access to both third- and first-person perspectives. For a more conventional Chicken Dinner, check out the video above for our PUBG tips and tricks.